Aluminum 21⁄2-NPT and 3-NPT threaded Line Vac air-operated conveyors convert ordinary pipe into a conveying system for parts, scrap, trim and other bulk materials. Their larger size makes them ideal for conveying larger parts and large volumes of material across long distances. The threaded Line Vac is designed to attach to standard plumbing pipe couplers, making it simple to build a complete system using pipe and fittings available from any home center, hardware store or plumbers supply. The conveyors eject a small amount of compressed air to produce a vacuum on one end with high output flows on the other. Response is instantaneous, and regulating the compressed-air pressure provides infinite control of the conveying rate. Applications include scrap and trim removal, material conveying, part transfer, fiber tensioning and filling operations. The conveyors are CE-compliant and meet OSHA pressure requirements. Smaller sizes, to 3⁄8 NPT, are available in stock. 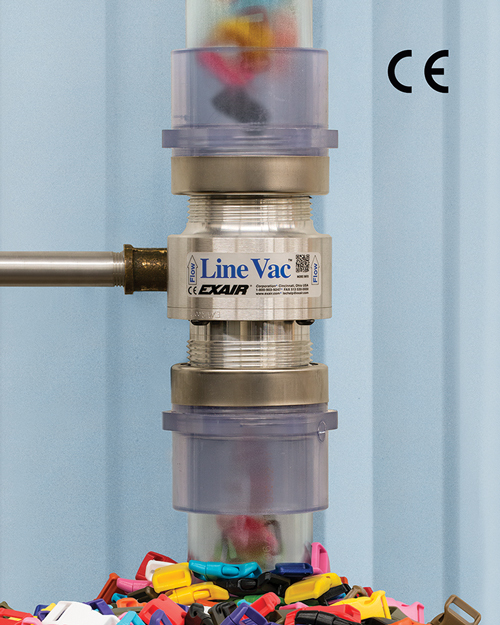 Threaded Line Vac models also are available in type-303 and type-316 stainless steel for more demanding high-temperature, corrosive and hygienic environments. They also come with smooth ends for use with hose and tubing, and heavy-duty units provide abrasion resistance while producing maximum power. If a secure pipe connection is required where the Line Vac will be frequently removed for cleaning, sanitary-flange units also are available.